Microsoft has just released a preview of the award winning Microsoft Security Essentials 2011 free antivirus for download. The latest version builds on the foundation of the original version and now gives MSE comparable protection to expensive paid antivirus like Norton Antivirus 2010 and McAfee. While Microsoft Security Essentials only has minor cosmetic updates (now resembles the SQL server 2008 theme), it comes with a completely rewritten antivirus engine and many more features. The Microsoft Connect website is having issues! Installation: The installation of the MSE was breeze. The best part about it was there was no annoying sign ups for search toolbars or bundled software (Microsoft apparently already has enough money). After the install was completed a restart was necessary. I opted out of it and an automatic update started (now conveniently integrated into Windows Update). The update, unlike other free antivirus offerings (Iâ€™m talking about a 100 megabyte definition update form the Czech Republic), completed in about 1 minute. After the update was done, a quick virus scan started. 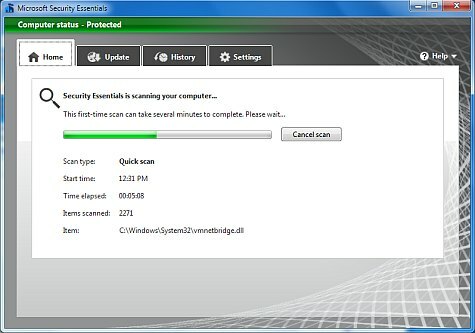 Most antivirus companies have quick scans but they are pretty lacking. 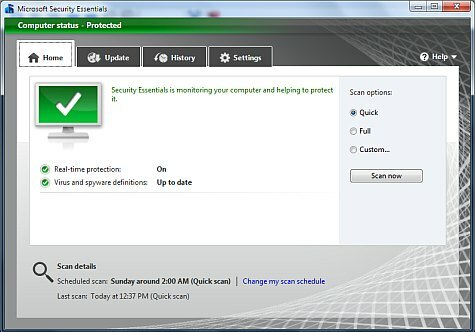 The new Microsoft Security Essentials scan was quick but also effective like a full system scan. The quick scan took about 10 minutes and scanned 89,000 items. There is a new process called MsMpEng.exe called Antimalware Service Executable which uses a hefty 88 megabytes of RAM. There is also another new process (which conveniently disappeared as I was writing this review) but offers a sort of run command line protection. This seems to prevent malware from starting a command line and making unauthorized changes. New antivirus engine â€“ The original antivirus engine has been completely overhauled to allow faster and more efficient scanning speeds. The speed and comprehensiveness of the quick scan seems to indicate that the new engine is very effective. Network Protection â€“ In the Microsoft Security Essentials settings page there is a new check box for Network Protection against exploits of known vulnerabilities. This to me sounds like a an IDS or IPS system but at the expensive price of free. Iâ€™ll update this entry as I find more interesting things about Microsoft Security Essentials 2.0 new for 2011. This release seems like Microsoft is including a lot of security functionality without telling the user, which may I add, is the best way possible.